Rick Mills has received two Creative Glass Center of America Fellowships and a research fellowship at the Royal College of Art in London, England where he studied under Keith Cummings. His work has been exhibited as venues such as the International Glass Kanazawa (Japan), The Contemporary Museum (Honolulu), Friesen Gallery (Seattle), and at the Museum of Northwest Art (Washington). In the past fifteen years Mills has completed four major public sculptures for the Hawai‘i State Foundation on Culture and the Arts, Art in Public Places Program. The sculptures are located at the Queen Liliokalani Student Services Center at the University of Hawai‘i at Manoa, the Hawai‘i Convention Center, Leilehua High school in Wahiawa, and the Maui Memorial Medical Center in Kahului, Maui. Mills is currently (2014) creating a series of five large scale monolithic cast glass sculptures for the new Hawai‘i State Public Library in Manoa. 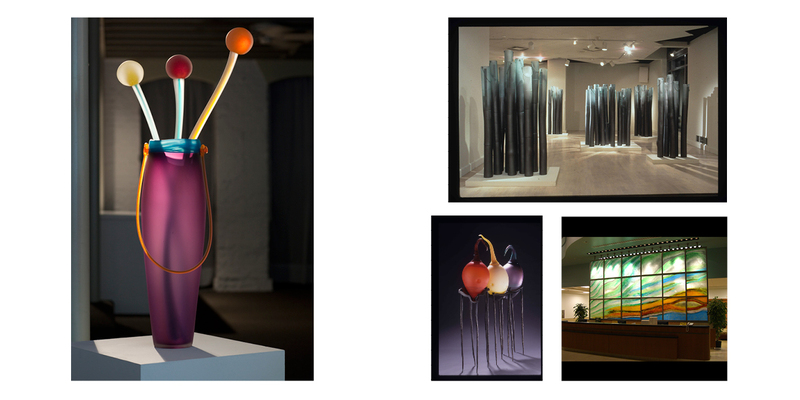 Rick Mills has taught courses in glass casting at the renowned Pilchuck Glass School in 1992 and 1998. In 2002 he received the Baciu Award for his glass sculpture entitled “The Midden and the Maid” in the Artists of Hawai‘i annual statewide exhibition at the Honolulu Academy of Arts. In 1999 Mills received the SFCA’s Individual Artist Fellowship Award. His sculptures and blown glass are in numerous private and public collections such as the Hawai‘i State Foundation on Culture and the Arts, Persis Corporation (Honolulu), DHX Corporate Headquarters (San Francisco), Glasmuseum (Ebeltoft, Denmark), Royal College of Art (London, England).